Published: Sept. 14, 2013 at 07:07 p.m. 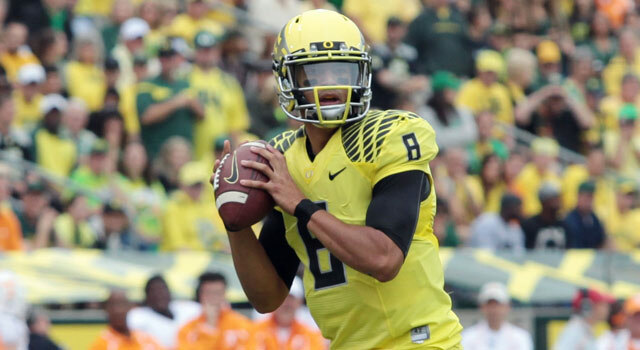 Updated: Sept. 14, 2013 at 07:59 p.m.
Oregon quarterback Marcus Mariota shredded the Tennessee secondary on Saturday. Marcus Mariota's accuracy was becoming a concern. After completing 68.5 percent of his passes last season as a redshirt freshman, the Oregon quarterback was hitting only 53.1 percent of throws through his first two games and was 2 of 7 to start against Tennessee on Saturday. All Mariota did from that point on was go 21-of-26, finishing with a career-best 456 passing yards and four touchdowns with no interceptions to hand the Volunteers a 59-14 humbling, their worst defeat since 1905. He added 27 yards rushing and a touchdown in a performance that should put him in the thick of the Heisman Trophy race. While Mariota has legitimate NFL tools, any competent quarterback could have put up big numbers with his wide receivers running free behind a beleaguered Tennessee secondary that had no answers for Josh Huff and Bralon Addison. And not that Mariota needed any more help, but true freshman tight end John Mundt exploded for 121 receiving yards and two touchdowns on five catches with junior Colt Lyerla sidelined by a virus. It's safe to say Oregon OL Jake Fisher won't have to eat his words.